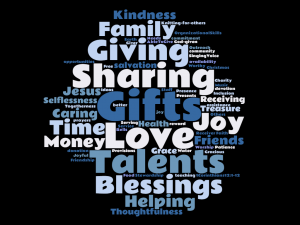 This week, our Immanuel congregation assembled at 8:15am and 11:00am to explore our collective thoughts about “Gifts,” this week’s prompt word. Our goal is to learn and grow together in our faith and relationship with God, and in our understanding of our role in that relationship. Again this week, 54 different people contributed several one word responses (sometimes more than one word – one clever person contributed a citation for an entire Bible passage 1 Corinthians 12: 1-12 – check it out here https://www.biblegateway.com/passage/?search=1+Corinthians+12&version=NRSV) about the word Gifts. Not including all the words in the Bible verse (but many were common to the rest of the list), there were 68 other different words the group provided. The Word Cloud above shows the most frequently cited words in larger print. Many people thought about Time, Talents, and Treasure as gifts they offer (generally and specific unique gifts), other thought about the blessings in their lives they know as gifts from God. Still others focused on the feelings associated with both giving and receiving gifts. What a range of responses, a wealth of gifts from God, a willingness to share them on His behalf— what a generous community Immanuel is! Here’s some things to think about: how do “Gifts” and “Giving” relate? How does it feel to give? How does it feel to receive? Does God feel joy and satisfaction as we are each given our special gifts of music or teaching or kindness to others? Are we joyous in our receiving? In our use of our God-given gift(s)? How do we say “thank you” to the Giver? Through your generous use of all His gifts to you! And now a word about intentional giving as a type of discipleship when it comes to your relationship with God and Immanuel as God’s “launch pad” for action in the world. Intentional giving, whether to a family member or God, demonstrates commitment to that individual by finding ways to act on that commitment regularly. It feels so good to be remembered as well as feeling good to do the remembering, right? Here at Immanuel, your regular, committed giving of all your gifts — Time, Talent, and Treasure – means our congregation can plan and deliver on the actions the Holy Spirit has called us to do in the world.